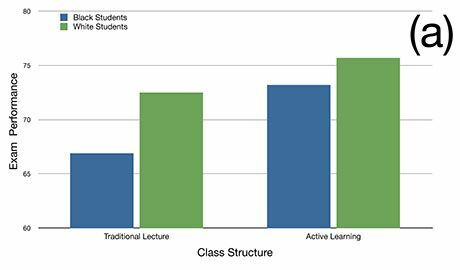 Studies suggest that replacing the lecture-hall model with an active learning model can help close the achievement gap between students of different cultural backgrounds. For years, politicians and policy makers have cried out for more students to complete STEM degrees to improve the nation's workforce. According to a Department of Education statistical analysis report (PDF, 1.6MB), nearly half (48 percent) of the undergraduates pursuing STEM degrees between 2003 and 2009 dropped that major -- and there are whole white papers trying to figure out why (PDF, 3.1MB). Some of the hypotheses proposed are an unwelcoming science culture and uninspired introductory classes. A recent study in the journal of CBE Life Sciences Education adds one more: lecture halls aren't the way to get minority students to keep taking science courses. 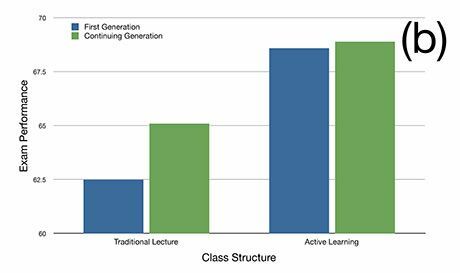 Lecture halls of hundreds of students are as much a feature of undergraduate education as an achievement gap between different races and socioeconomic backgrounds (PDF, 1.2MB). Interestingly, the new study, authored by two biologists, suggests that the former influences the latter. Changing the way lectures work -- providing more student interaction and feedback (something educators call active learning) -- could begin to chip away at the achievement gap. Figure 1. (a) The STEM achievement gap between black and white students that is present in traditional lecture classes narrows with active learning. The active learning biology class of this study consisted of guided reading and online exercises done before class, in-class assignments (often in student teams), and class discussions. The course demographics were 59 percent white, 13.9 percent black, 10.3 percent Latino, 7.4 percent Asian, 1.1 percent Native American, and 8 percent were undeclared, mixed race, or international students. Additionally, 24 percent were first-generation students (see Figure 1. (b)). Figure 1. (b) The achievement gap between first-generation and continuing-generation students completely closes in an active learning introductory biology class. Dr. Sarah Eddy, a University of Washington biology postdoctoral fellow and an author of the paper, reports that these active learning methods can be used in large classrooms. She mentions that one large biology course at the University of Washington uses these methods with 700 students, and a separate study shows that scaling up is not costly or overly burdensome. In these courses, students get feedback about their work during class time. In essence, STEM class structure is adopting that of a liberal arts class. The use of an interactive style of teaching "is almost catching up for us in STEM," Eddy admits. It could be that active learning breaks a cultural barrier. Student surveys showed that in a traditional lecture hall, black students "were very uncomfortable speaking up in class. And, under this reformed course, they were two times more likely to speak up in class," said Eddy. Part of the problem, Eddy argued, is that universities teach based on the culture of the populations they've historically served. "And those populations tended to be white and upper middle class," she said. 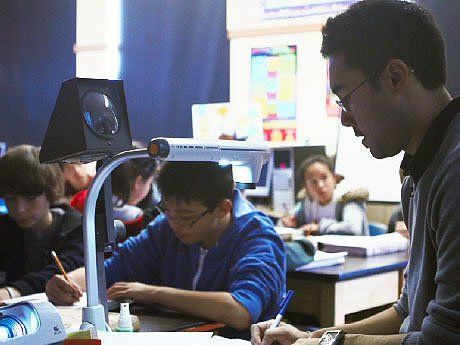 This teaching style does not translate across cultures, according to Eddy, "since different populations bring different values sets into the classroom," as this study reports. Admittedly, we still have much work to do toward understanding why this teaching method works. "Interaction is really what is important in this model for closing the gap," said Eddy. She hypothesized that learning methods that are based on "cooperation versus [competition] could be a very important component of the difference."